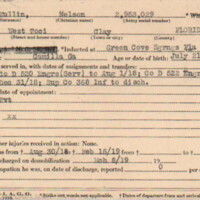 The abstract of military service for Nelson Mullin (1887-1944). The card includes name, date and place of birth, race, units and ranks, dates overseas, and date of discharge. Digital reproduction of original typewritten abstract of military service, March 8, 1919: World War I Army Card Roster, Box 11. Abney, Barb. "VA Selects UCF Historians to Archive Stories of Deceased Veterans." UCF Today, March 13, 2017. Accessed August 9, 2018. https://today.ucf.edu/va-selects-ucf-historians-archive-stories-deceased-veterans/. General Adjutant's Office. 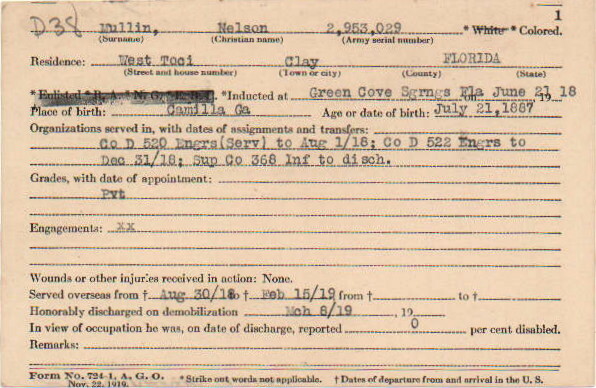 “Abstract of Military Service for Nelson Mullin.” RICHES of Central Florida accessed April 25, 2019, https://richesmi.cah.ucf.edu/omeka/items/show/10376.